Many first-time buyers look forward to finally visiting listings and stepping into an actual home they’ve seen only online. At this point, you’ve gone through what seems like the hard part — determining your needs and wants with your agent, talking to lenders, getting approved, lots of paperwork, narrowing down neighborhoods, plus time spent thinking, hoping, dreaming. Now comes the fun part … looking at homes every weekend! House hunting can be exciting and even fun at times, but you still need to have a strategy in place. That’s why the tips below can give you an added edge. It covers 2 things you should never do, and 2 things you should do. It’s that simple. 1. DON’T take in too much at once. House hunting is waaaay different than shopping for anything else in life. For one, there are only a certain number of homes (generally about 6 to 8) that you should see during one outing. Not only will seeing more than six homes completely stress you out and wear you out, but seeing too much in one day means that it’s that much harder to narrow down your criteria well enough to know even what you are looking for! You don’t want to overdo it on any day or it all becomes muddled and too confusing. If you are feeling overwhelmed, go back to the drawing board and focus on your criteria and budget. And, be sure to never look at homes in areas you’d never live in — that can add to the confusion and make this process much harder! 2. DO get some evidence and reminders on each home. Even if you limit the number of homes you see in one day, you’re still going to get confused and mix things up. Even those of you with photographic memories that tend to remember everything! That’s why we recommend taking photos of each home with your phone and make notes on paper or an app that can help you recall what you liked and didn’t like about a particular home. You don’t have to get a shot of every angle, but a good front and back picture, with a few detailed photos of the interior can help you remember features, amenities, and floor plans that will influence your decision. Write down specific and descriptive notes about each home and its surrounding factors, like schools, shopping, metro access, nearby parks and other amenities. Do this when you’re inside the home or immediately afterward so you don’t leave something off. Both the photos and the notes will come in handy when you’re comparing your options later that day or the next day (depending on how fast you need to put in an offer). 3. DON’T take advice from everyone in your life. When it comes to making one of the biggest purchases of your life, everybody in your life should NOT cast their vote or give their opinion. Put your blinders on and “you do YOU.” Limit any feedback you receive to people whose opinions you value and think will contribute a positive impact on your decision. There is no “one-size-fits-all” approach to buying a home. Your financial situation, criteria, and long- and short-term goals might be completely different than someone offering you advice. Say thanks but no thanks to friends and family with little home-buying experience or those who want to offer their opinion but you know will provide no real benefit to your decision-making. You are the one who will need to make the final decision, but it doesn’t hurt to surround yourself with a few trusted friends or family who can offer constructive feedback. And, please, limit your time with those who will confuse you and complicate your house hunting. 4. DO take a second look. When it comes to making one of the biggest purchases of your life, this home deserves more than just one look-see. You’ll be amazed at what you missed or glossed over the first time around. Depending on the current market and how fast things are moving, try to go back to a home if you’re interested in making an offer. It’s hard to take everything in at once, so when you have a good feeling (or doubts) about a certain property, don’t hesitate to schedule a revisit to validate any feelings you may have. 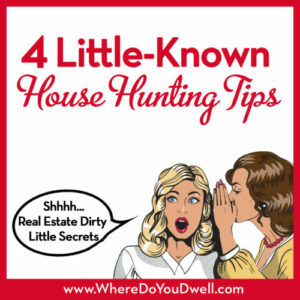 Take these four little known house hunting tips to heart and you’ll be one step ahead of everyone else out there! 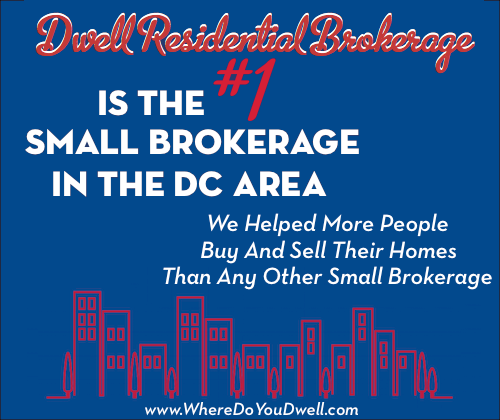 And, stay tuned for next week’s article, Answers to Our Buyer’s Most Frequently Asked Questions (FAQs)!